As many as 1 million Californians, mostly in the farming communities of the Central Valley, have dangerous levels of an unregulated chemical linked to cancer in their drinking water, according to California’s State Water Board. State water officials found potentially harmful levels of “1,2,3-TCP”, or Trichloropropane, in drinking water sources across the state all the way back in 2001 but are just now considering the implementation of a legal maximum contaminant level. TCP was present in two widely used soil fumigants marketed for decades by Shell and Dow Chemical beginning in the 1950s. Those fumigants were taken off the market in the 1980s. But because of its widespread use as a pesticide in agricultural areas, the chemical seeped into groundwater in dozens of California counties. State and private water experts say it remains there and is now found in dangerous levels in the drinking water served by 94 different public water systems. “Most Americans are not aware that there are lots of not only regulated, but unregulated contaminants in their drinking water,” said Bill Walker, vice president and managing editor of the Environmental Working Group, a nonprofit dedicated to protecting human health and the environment. Environmental Working Group released a report in April blasting Shell and Dow for failing to pay for cleanup efforts in communities with TCP in their water. Walker says the impact of TCP in drinking water disproportionately affects mostly poor, rural communities. State data show about two-thirds of the 94 affected water systems are in the Central Valley, although the chemical also has been found at levels experts say is unsafe in parts of the Bay Area, Sacramento and Los Angeles. 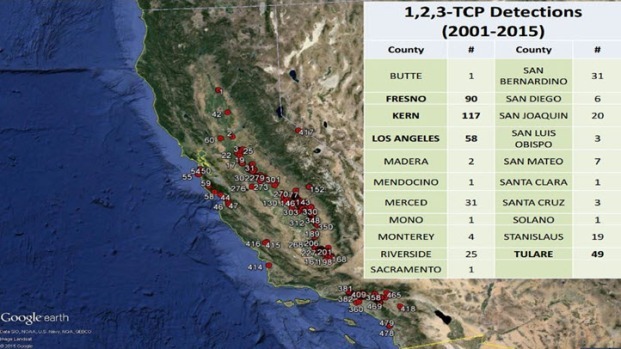 Three public systems in San Mateo County, and one each in Santa Cruz and Monterey counties, showed high levels of TCP. 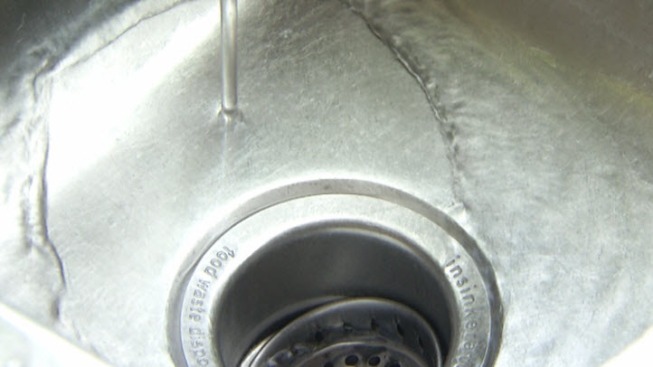 Six other wells not connected to public systems in San Mateo County, Solano County and Santa Clara County also had TCP detected in them. Shell and Dow Chemical did not respond to requests from NBC Bay Area’s Investigative Unit for comment. The two chemical companies have argued in court they shouldn’t be responsible for damages or cleanup costs because the state doesn’t have a maximum legal limit set for TCP in drinking water. According to the Fresno Bee, an attorney for Shell called any purported link of TCP to cancer “fear-mongering” while fighting a lawsuit filed by the city of Clovis. Attorney Cal Burnton argued during the lawsuit that Clovis’ science was flawed, that residents had not been harmed by TCP in their water and that TCP has never been declared a human carcinogen. A jury in that case sided with the city of Clovis, ruling against Shell and Dow and awarding nearly $22 million in damages to Clovis. Activists and environmental groups argue Shell and Dow should bear cleanup costs where TCP contamination is found because of the chemical's widespread marketing to farmers. Monaco is working with Central Valley communities to test their water for contaminants such as TCP. She’s also bringing their concerns to Sacramento, where she said their voices are often not heard. In Tombstone Territory, a small, unincorporated part of Fresno County, residents had no idea the water they pump from private wells could be contaminated with TCP until Monaco brought it to their attention. The community borders the town of Sanger, where drinking water served by the city's public system is contaminated, according to California Water Board data. He’s not sure why that is but suspects it may have something to do with the water ever since Monaco came knocking. Although, there haven’t been studies on TCP’s effect on humans, a 2009 EPA report shows scientists determined it causes cancer in lab animals. In 1992, TCP was added to the list of chemicals known to the state of California to cause cancer. Across the street from Cano, Carolina Garcia plays with her young daughter in the front yard of her home. She drinks only bottled water but still worries because they use well water to cook and bathe. Although there is no legal limit set for TCP anywhere in the country, attorney Todd Robins has settled eight lawsuits filed against Dow and Shell on behalf of small public water systems affected by TCP. The exact terms of those settlements have been sealed and remain confidential. “I think that it’s a pretty dirty little secret that a state as prosperous as California has so many water quality problems,” Robins said. Robins represents the majority of the 43 individual small water systems who have sued Shell and Dow for cleanup costs and damages related to TCP contamination since 2004. Thirty-three of those lawsuits remain pending in court. A jury did side with the chemical companies in a case filed by the city of Redlands in 2004. That case was not tried by Robins. Although no state in the country has set a maximum contaminant level (MCL) for TCP, California water officials expect to formalize an MCL for the chemical in drinking water soon. Staff at the California Water Resources Control Board recommended setting that MCL limit at five parts per trillion, but the proposed regulation has not yet been finalized. If that happens, officials say public water systems will be required to collect and analyze samples for TCP beginning in January of next year. If the water served to the public exceeds the MCL, the water system will be required to clean it up. But just because the state sets an MCL doesn’t mean the cleanup will actually happen. A previous NBC Bay Area investigation found that nearly 700,000 Californians still have drinking water contaminated by chemicals already regulated by the state.